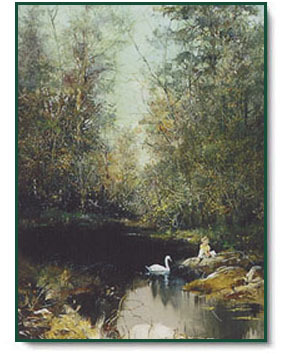 "To the pure, all things are pure..."
Through her art and her written thoughts, artist Carolyn Blish shares with us a unique wisdom of heart and spirit. Her vision encompasses all of God's creation - from the secret smile of a child and the glorious color of a flower to the sunlit beauty of the American shore. A baptism of spirit and love, Carolyn's art is now available in this series of exquisitely framed prints. Coupled with the artist's favorite Scripture, these images become more than wonderful paintings, they are reminders that all life is a work of art. "It's all His design," says Carolyn, "not mine." Comes in a walnut burl frame. 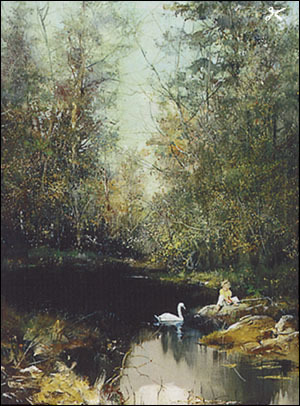 The Swan copyright© 1998 by Carolyn Blish.